Dr. Allan Ho is an Assistant Professor in the Faculty of Medicine, at the University of Alberta. He is an Otologist in the Division of Otolaryngology Head and Neck Surgery. 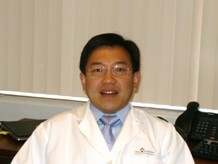 Dr. Ho is a medical graduate from the University of Newcastle upon Tyne, United Kingdom. He was a Lecturer and Examiner in Anatomy in the Faculty of Medicine, University of Newcastle upon Tyne. After completing his residency in General Surgery in the North of England he was awarded Membership of the Royal College of Surgeons of Edinburgh. He was admitted as a Fellow of the Royal College of Surgeons of Edinburgh in Otolaryngology Head and Neck Surgery after completing his Otolaryngology residency in the North of England. He obtained fellowship training in Otology, Neurotology and Skull Base Surgery in Halifax, Nova Scotia. While in Halifax he was also a Lecturer in Otology and Neurotology at the University of Dalhousie. He was awarded a Masters in Health Sciences Research (Otology/Audiology) with Merit from the University of Leeds, United Kingdom. research across Europe and North America. His research interests are in Implantation Otology which include Bone Anchored Hearing Aids, Cochlear implants and Middle ear implants, as well as in Eustachian Tube disorders and automation of hearing assessments.